Over the past couple of years, we have seen a growing number of fun and exciting ways to help raise awareness for prostate cancer and men’s health. Movember, for example, has become increasingly popular across the globe. This summer, a couple of high-octane, awareness and fund-raising events are taking place on both sides of the Atlantic. I encourage you to check out both of these events and consider participating – jump in and fasten your seat belts, we’re going for a ride! For the second straight year, American urologists Dr. Jamin Brahmbhatt and Dr. Sijo Parekattil have organized the Drive for Men’s Health. Last year, the team drove an all-electric powered TESLA from Clermont, Florida, to Manhattan, New York. This year, on Thursday, June 11th, the Drive for Men’s Health will again start in Clermont, Florida. However, once they arrive in Manhattan, they’ll take a sharp left turn and head West to Los Angeles, California. The 6,000 mile journey is expected to take nine days to complete. Along the way, the team will need to stop over 60 times to plug in and recharge. Over the course of the drive, the urology duo will host live webcasts, on a variety of men’s health topics, with over 200 speakers from around the world. The drivers hope the car, and technology used during the drive, will function as a magnet to pull men and their loved ones into further discussions about healthy living. This year’s Drive for Men’s Health coincides with National Men’s Health Week in the United States. As summer approaches, auto racing heats up in Europe. In July, amateur hockey player Adam Clark (Clarky) and his friend Robert Lamden (Lambo) will strap themselves into a 28-year-old Toyota MR2 Mk1 for the 2015 Banger Rally Challenge. The race is similar to the Gumball 3000 Rally, but with old cars that cannot be worth more than £350. Over the course of ten days, the team will attempt to drive 3,000 miles across France, Switzerland, Monaco, Italy, and thru the Alps. The purpose of the event is to raise awareness and money for Prostate Cancer UK, the largest men’s health charity in the UK, dedicated to helping men survive prostate cancer, and enjoy a better quality of life. 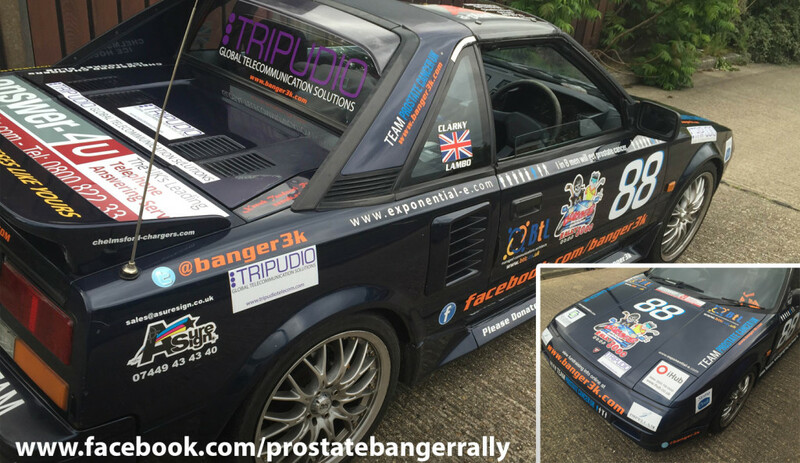 Clarky and Lambo have already raised nearly £9,000 for Prostate Cancer UK by selling sponsorship spaces on the car, and from donations. When the team finally arrives back home in London, England, Clarky will wrap up the fundraising event on the ice, as assistant captain, playing for Team Prostate in an All-Stars Charity Ice Hockey Tournament at the home of British ice hockey, Sheffield Arena. Every man has a unique set of interests. Some men respond to technology under the hood, while others enjoy the screeching of tires on pavement, or the excitement of a shot and a goal. When it comes to men’s health, this summer offers something for just about everyone. Please consider giving a shout out to Jamin and Sijo on Twitter or Facebook as they drive across America, and/or consider donating to Clarky and Lambo who you can follow on Instagram and Twitter, and for updates along the Banger 3K, please “friend” on Facebook. By donating and supporting the boys, you will not only help shift men’s health into high gear, but also help keep our patients and our friends out of the penalty box and firing on all cylinders. Dr. Brian Stork is a community urologist who practices in Muskegon and Grand Haven, Michigan, USA. He is a member of the American Urological Association’s Social Media Workgroup, and is the Social Media Director at StomaCloak. You can follow Dr. Stork on Twitter @StorkBrian. Brian & BJUI great summary of some of the efforts this month to change the face of men's health. First and foremost we would like to say a massive thank you to Dr stork and the team at BJUI for publishing this fantastic article covering both challenges. If you contribute towards a Prostate Charity already but would still like to track our progress then please do add us as a friend on Facebook as per the article. Its just as important to raise awareness as it is vital funds, and cheer us on! Because of you guys, men's health is becoming more fun - It's about time! The purpose of Men's Health, it would seem to me, is to start a conversation about common medical problems that can keep men from being active and achieving their full potential. Problems such as hypertension, diabetes, coronary artery disease, obesity, sleep apnea, depression and prostate cancer. Men's Health, in my opinion, is a lot more than just testosterone replacement and treatment options for erectile dysfunction. Healthy living and longevity have their rewards - like this guy, I'm planning on "going out with my boots on." Men's health is an under-represented area. The main area of men's health for the U.S. government is mentioned in the Office of Women's Health in the Dept. of Health and Human Services; there is no similar office for men. Historically, there have been biases favoring men. Things have improved, but with those changes perhaps it's time to have an Office of Men's Health, more research and more attention on both genders. Thanks for raising the issue Brian - and I hope the drive goals well and helps bring more progress in men's health awareness. Thanks Dr. Stork for this initiative. Much needed. Men's health is where Urology, Family Medicine, Cardiology, Psychology, and so many other disciplines all intersect. Sometimes men need carrots (often sexual health) to lead them to better overall health. Guys don't make their health a priority. Big new survey that was commission by Orlando health prior try to drive found that over 80% of men remember the make and model of their first car; however, under half remember their last doctors appointment. This is why it is important we use wood guys like – cars and technology – to motivate them to talk about their health. 6000+ miles! That is some drive. Congrats gentlemen!